Peter Chrysologus ("Golden-worded").became famous for his short, inspiring homilies, 176 of which still survive today. 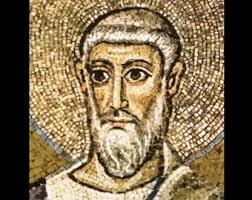 Summary:St Peter Chrysologus:Bishop, Doctor of the Church. Born late in the fourth century at Imola (Italy); died on 31 July about 450. Bishop of Ravenna, known as “Chrysologus” (golden-worded). Noted for his eloquent sermons, his loyalty to the bishop of Rome, and his dedication pastoral service. Peter was bishop of Ravenna, the city famous for its mosaics, in the mid 5th century, when the Empress Galla Placidia was living there. On hearing his homilies she is said to have given him the name Chrysologus “Golden-worded”. His surviving 176 homilies show what an excellent preacher he was. Patrick Duffy tells his story. Peter was born at the city of Imola (30 miles west of Ravenna) and was ordained a deacon there by its bishop Cornelius. 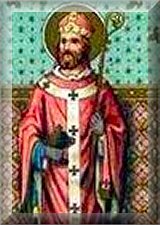 During a visit with his bishop to Rome, Pope Sixtus III appointed him bishop of Ravenna in 433. As a preacher Peter was afraid of boring his audience and became famous for his short, inspiring homilies, 176 of which have survived. He spoke about the incarnation in simple and clear language. His homilies are an indication of how the liturgical year was celebrated at that time and also show how he stood against the christological heresies at that time. The imperial princess Galla Placidia on hearing his first homily is said to have given him the name Chrysologus, “Golden-worded”, and she later became a patron of many of his projects. As bishop Peter was concerned with the survival of paganism. He preached especially against the annual carnival, saying: “He who delights in the devil cannot rejoice in Christ”. But he urged his listeners to have confidence in the forgiveness offered through Christ. He was also an advocate of frequent communion. 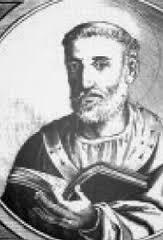 When Leo I became pope in 440 Peter became an advisor to him and one of his staunchest supporters both in opposing the heresies of the time and in defending the primacy of the Church of Rome. When Germanus of Auxerre visited Ravenna to plead the cause of the rebellious Bretons with the emperor, Peter warmly received him and when he died there Peter presided at his funeral. Peter himself died in 450 while on a visit to his native Imola. A contemporary portrait of him exists in the mosaics of the Church of San Giovanni Evangelista in Ravenna, where he is depicted among the members of the eastern and western imperial family, showing his extraordinary influence. A collection of his 176 homilies was made by Felix, Bishop of Ravenna (707-17). Peter was declared a doctor of the Church in 1729.